Friday: when you traveling you need an outfit that is both comfortable and stylish. 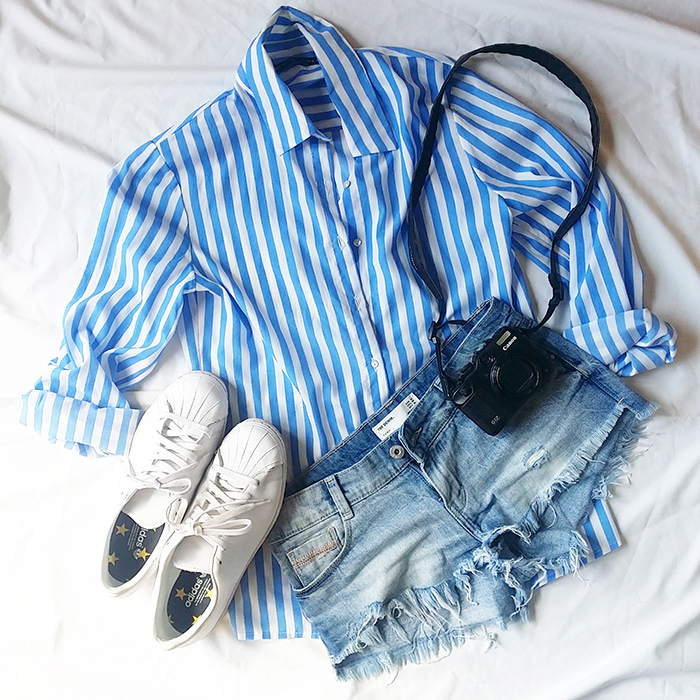 Favorite sneakers, light shirt and denim shorts. Saturday: if you decide to spend a day by the pool or at the beach, the only thing you will need is obviously a swimsuit. Saturday night: for after-sunset cocktails and dinner substitute light shirt for a bohemian blouse and pair it with heeled sandals. Sunday: if you want to explore the sights and local shops before you leave the city, it�s important to have outfit which is suitable for a lot of walking. Pair the same shorts with gladiator sandals, hat and hippie blouse. Whether you're off for a weekend getaway or planning a sunny summer vacation these fashion and beauty must-haves need to make it into your suitcase. The most important thing is not to overpack and to pack things you'll actually wear. Once you have these covered, you�ll be prepared for a warm weather getaway! Now you are ready for a getaway and don't forget to send a postcard!